Contouring has been talk of the make-up town for at least a year now and although I'm no Kimmy K when it comes to shaping my face, I do use a couple of products in my everyday routine to give me a little definition, colour and shimmer. These two have been a solid make-up favourite and in my make-up bag since the day that I got them. It was literally love at first use and I know I've talked about them a fair few times already on here but I do feel like they deserve another mention! 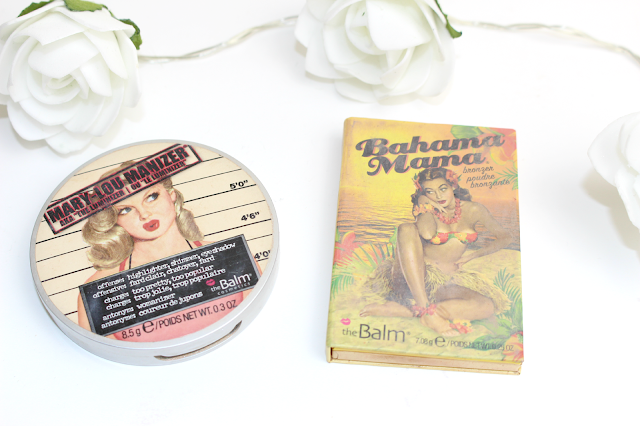 These two are both from the ever-growing cosmetic brand theBalm - on the left the Mary-Lou Manizer highlighter and on the right the Bahama Mama bronzer - and I cannot rant and rave about these enough. The highlight is a gorgeous pinky silver shimmer highlight which gives a gorgeous sheen and glow to the skin and the bronzer is a fantastic matte tan shade, which I always find hard to get hold of (For under £25 anyway!) - together they are a dream team! I start off my doing my usual base of make-up - primer, concealer and foundation. I then use my Zoeva Sheer Luxe Cheek Brush to sweep the bronzer into the classic '3' shape from my forehead round to my cheekbones and then down towards jawline. At this point I look a bit OTT and ridiculous but that doesn't last long. I then use the other end/side of the brush to start of the highlighting. With the Mary-Lou I usually pop a bit alongside/above the line I had made along my cheekbones, then down my nose, a tad on my forehead and a little on my cupids bow and chin. Then it's time for the blending - I use my big fluffy Real Techniques powder brush to buff it all together in small circular motions, blending away those harsh lines and creating a soft, subtle and wearable bronzed and highlighted look. As you can see.... these are running thin and I'm already panicking about running out! Even though I'm trying to save money this next year these will have the be a re-purchased as I really can't see me living without them anytime soon. What are you favourite bronzers and highlights? Have you tried either of these? I don't have Mary Lou but I love Bahama Mama! I'd need to use mine a little more to hit pan though! WOW that pan on Mary Lou!!! bahama mama has been on my wishlist for so so long! Mary-Lou is so gorgeous I can see how you have hit pan. I need to get Bahama Mama! Those products are very loved! I enjoy Mary Lou, but I have to check out the bronzer! 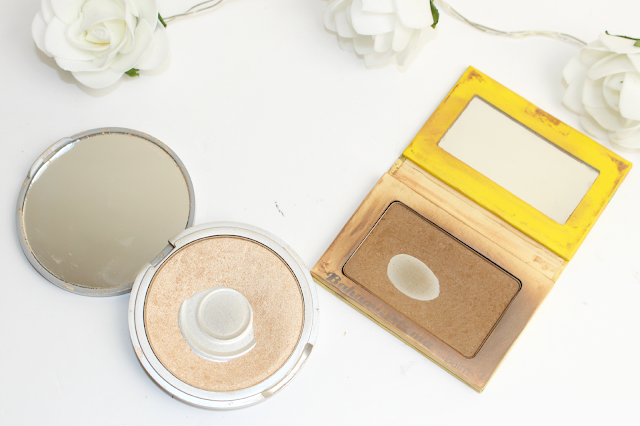 I adore the Mary-Lou Manizer highlighter, I haven't tried the Bahama Mama bronzer though! I've never tried either of these products, but I really need to! Everyone seems to love them both. These both sound like amazing products - I love theBalm! I have heard so many good things about these products and I have still yet to try them. I need to get my hands on them fast. Great post. I use both of these products too and they're my favvvv! I don't contour THAT much (I seriously think it does nothing for my round baby face), but I DO love to highlight, so I must always have a Mary-Lou Manizer at the ready!